Hi Thayne-san, today we’re going to visit Isegen, in Kanda. 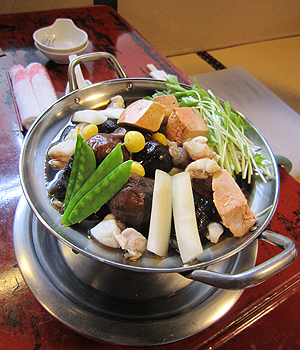 It started as a seafood restaurant in 1830, but of all their dishes, the monkfish hotpot was the most popular, and so in the Taisho Period they became, and remain today, a monkfish hotpot restaurant. 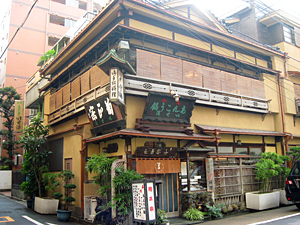 I know all the Toto Norenkai businesses have a lot of history behind them, but the Isegen building is also really old. It’s really nice! The building is over 80 years old. It’s designated as a historical building of Tokyo. Well, shall we go in? Hi! Thayne-san, and Concierge-san, it’s great to meet you. I’m Tachikawa Hiroyuki. It’s a pleasure. I’m Thayne. You’re quite young for a restaurant owner. May I ask how old you are? I’m 30. 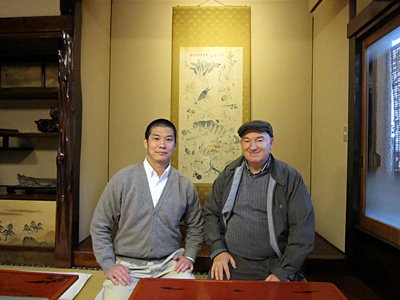 After finishing university I worked for a couple years at a bank, but then my father fell ill, and I came back home. What was it like returning home at a young age to take over the restaurant, after working at a company? Ever since I was a child I had had monkfish hotpot and knew how tasty it was, and I had watched my father and grandfather working in the restaurant, so I actually thought it would be fun to take over the shop. I didn’t have any problem at all about returning home. At first, I did think it would be a little boring, frankly, because I had been working in a really busy environment. But once I actually started working, I realized that every day is different. The ingredients we buy change, and we get new customers. I’m also always working on our menu, helping with monkfish conservation, and thinking about what kinds of things our unique shop can share with the world. So you manage your business starting from how to protect the monkfish? By the way, are you very familiar with the monkfish, Thayne-san? Yes, it’ll be my first time to both see and eat one. Well, I’m just about ready to clean a monkfish. Would you like to see it done? Wow, that’s quite a fish. It’s got a very…uh…unique face. Yes, it’s quite charming, haha. This one is about 8.8 kg, which is about mid-size. We get some up to about 20 kg. If you look in their mouth, you can see two rows of teeth. They use those to eat both fish and shellfish. Let’s start. First, we wipe the slime off with the back of the knife and hang the fish on the hook with its head facing up. Then we take out the liver. Shall we weigh it? . . . it comes to 1.1 kilograms, which means exactly an eighth of its total body weight is the liver. Monkfish with large livers are particularly delicious. 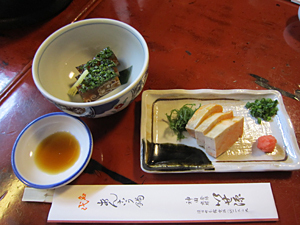 Steamed monkfish liver, which is called kimo-sashi (kimo means liver), is the perfect accompaniment to sake. The next organ we cut out is the stomach. Then, the ovaries, followed by the large fin. The skin is full of collagen, and so it’s especially popular with women. Finally, the cheeks, . . . and body. That’s everything. 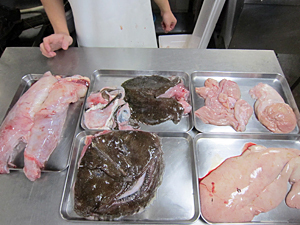 right: liver, stomach, ovary, fin, skin, body, cheeks. Wow, almost everything is gone now. Does all of this go into the hotpot? The seven dogu of monkfish!? 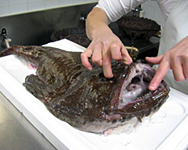 With other fish, we eat the organs or skin, but only with monkfish do we use such a term Kind of strange, isn’t it? Well, Thayne-san, are you ready to enjoy your first bowl of monkfish hotpot? Mmm, that was really good! 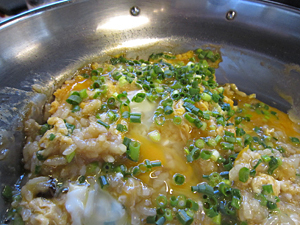 Tachikawa-san, how do you make the broth? That’s a secret! We use simple ingredients―it’s mainly dashi, sugar and soy sauce―but the way you heat it and how long you let it sit changes the flavor considerably. And the broth isn’t complete without the correct balance of flavors from the monkfish and other ingredients we simmer it with. Monkfish can actually have a slightly unpleasant flavor, but if it’s fresh and carefully prepared, it’s a really tasty fish. The market people, as well as the fishermen, know that we only accept the best catches, and if they get an especially good monkfish they say, “this one’s for Isegen,” and save it for us. You’ve built up a lot of trust over your many years in business. Today we gathered around a hotpot here in a large tatami room with a tokonoma, a folding screen and shoji paper screens―it really feels like Japan! The conversations of the other customers made for a lively, harmonious atmosphere, and really added to the enjoyment of the meal. Yes, our restaurant has always had this kind of large open tatami room. Lots of people in the same room crowded around hotpots, talking and laughing with each other―that’s the kind of experience I’d like for future generations to have too. Thanks! It was a lot of fun and the hotpot was delicious! We’ll be back!